There are few things weirder to the senses than a black IPA. Close your eyes and breathe in over the full glass, what do you smell? Piney, citric hops. Take a sip. Suddenly, malt. Sweet. Smoke. What on earth? It’s a…. taaaa daaa! Black IPA! Psych! This lovely offering from North Peak from Traverse City, MI (the cherry capital of the world, so they tell me) has pretty much everything going for it that I want in a bottle of beer: that enticing Red Stripe-shaped bottle, wonderful graphic design and its black IPA is called “Furry”. How could I not pick one up? 7.2% ABV, $2.10 single-bottle price for 11.5 oz. No information on standard packaging quantities but I’d guess four. Unfortunately, I had to go outside of their website to find information since their beer list only features what’s currently on tap. Fortunately, I have one of the listed beers in reserve. For our purposes today however, I had to use the Beer Advocate website (but didn’t read the opinions, just the specs). My previous exposure to this variety of beer was only Allagash’s version and admittedly, I did not think it could be topped. It was “thin” like Guinness but had so much malty yet floral flavor I could barely stand it. At my former place of employ (a brewery), I had a standing order with the barkeep to alert me when the kegs ran low enough to be polished off after work and I did. Twice. Urp. 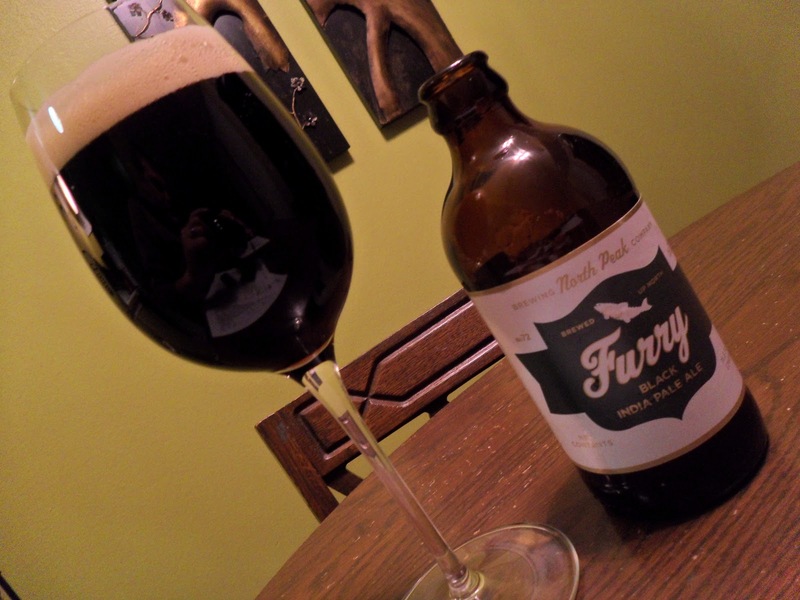 Furry however, gives Allagash an absolute run for its money in the best way possible. It’s richer, maltier, a bit more bitter and slightly more hoppy – basically it’s Allagash plus half. “Complex”, be it an overly-used term to describe beers that are more than two notes, is pretty accurate when describing most black IPAs because they’re so weird but it’s most definitely accurate with Furry. In my research to explain what makes a “black IPA”, I stumbled across this beer blog and I gotta say – brother has hit the mark. It’s not from India and it’s certainly not pale. He’s right, there should be a conversation about this because everyone’s using a moniker that is just… wrong. The description on his page is correct – mildly bitter, middle-range hops, darkly carmel and mildly burnt. Add “chocolate” to that and you have a stout, but what happens to the hops? There are bright hops here, too. “Made with Chinook, Columbus and Cascade hops and Pilsner, C-40, Midnight Wheat and Carapils malts” – ratebeer. As I said, it’s unique amongst its class, truly exemplary and 100% worth picking up if you see it.